Pure Move 2500 review | What Hi-Fi? DAB radio has many virtues, but portability is rarely among them. Digital broadcasts are notoriously sensitive to the position of the receiver, which tends to preclude much in the way of movement. That doesn’t stop manufacturers trying, of course. 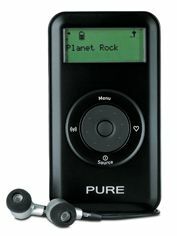 Pure, an acknowledged DAB expert, scooped an Award back in 2006 with its PocketDAB 1500, and the Move 2500 is its latest attempt to advance the portable radio art. Lightweight, compact and with a battery capable of 14 hours of playback between charges, the Move 2500 is nicely finished and ergonomically sensible. It’s packaged with a pair of reasonably comfortable in-ear headphones, noise-isolating inasmuch as they fill average ear-holes almost entirely. The quality of DAB broadcasts is infamously variable, but given something worthwhile such as the BBC’s Radio 3 to deal with, the Pure serves up a spacious, detailed and nicely balanced sound. and benign crispness at the top, and the 2500 handles dynamic shifts well. – treat the Move 2500 as a truly portable device and those peculiar DAB monkey noises, chirrups and squelches that indicate imperfect reception are all too prevalent. These can be eradicated by switching to FM reception, of course, and there’s a strong case for saying that the Move 2500 sounds better with FM broadcasts than with their DAB equivalents in any case. But as a truly portable DAB radio the Pure comes up fractionally short – and it isn’t even really this device’s fault. The mercurial nature of DAB reception means that listening is sometimes as painful as it is pleasurable.